The season is moving right along here in South Florida. We've had a taste of summer this past weekend with a blast of heat and humidity, but by week's end we'll be into the 40's overnight. A reminder, next Monday is the Carbonell Awards Ceremony at the Broward Center for the Performing Arts, and yes, there's an after-party at Club Revolution courtesy of the South Florida Theatre League. 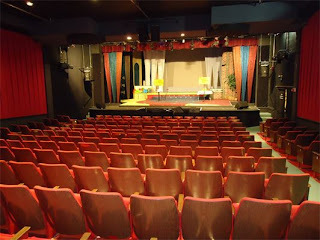 Today's "dark" theatre is The Delray Beach Playhouse. This venerable community theatre has provided the artistic heart to Delray Beach since 1947. Their current production is The Last Romance, which plays through April 7. Florida Weekly reports that Kenneth Kay is joining the staff of The Plaza Theater as Director of Education and Outreach. Kay is no stranger to South Florida theatre, or that space in particular. He appeared frequently in plays at Florida Stage, the former occupant of the theater at Plaza Del Mar. His first project will be a production of Sleepwalk, a William Mastrosimone play that deals with teen suicide. The surprise is that I’m hard pressed to find more than one nomination this year that makes me wonder what we were smoking in the judge’s nominating meeting – almost a world’s record. No one who wins will be a head-scratching embarrassment. Everyone who takes home one of the lovely bronze eggs will richly deserve it. "Of course the game is rigged! But don't let that stop you; you can't win if you don't play." We'll see you at the awards on April 1st. But if we don't, we won't be surprised if you're overlooked next year, too. South Florida theaters have long produced shows lacking the proverbial safety net of having understudies for major roles. Directors and stage managers have often ended up going on for sick or injured accidents. Burt Reynolds famously went on stage with script in hand to read the part of a leading lady - to thunderous applause. But it's rare for an actor in regional theater to be replaced by an actor who played the role on Broadway, especially when it's just for a few performances. But when Sarah Amengual took ill, it makes sense to call on another Miami actress who's not only played the role, but has performed at Actors' Playhouse a number of times. Janet Dacal may have originated the role of Carla in the Broadway hit musical In The Heights, but her last turn in the show was as Nina. The Drama Queen, Florida Theater On Stage, and Broadway World all jumped on the story, of course. And you still have a chance to catch her performance on Wednesday. TheatreFace goes over all those stage terms that some people find confusing. Broadway World reports that Gordon McConnell will once again be directing a radio play with actors from the Burt Reynolds Institute for Film and Theatre. The Third Man plays at The Mirror Ballroom on April 13, 2013.